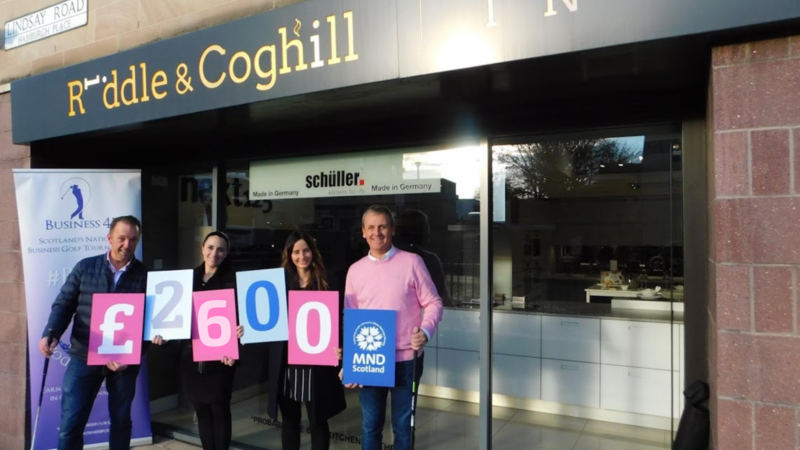 Edinburgh based interior design firm, Riddle and Coghill scooped £2,604 for MND Scotland a cause close to the hearts of directors Gus Riddle and Ian Coghill. The firm became Scotland’s national business golf champions in 2018 and won the lump sum for MND Scotland in the process having qualified as winners of the Edinburgh event. The donation was presented to MND Scotland representative Morag McGown at their Edinburgh offices near ocean terminal which houses a stunning showroom of kitchens and bespoke interior design solutions. Morag said “I’d like to say a huge thank you to everyone at Riddle & Coghill for their continued support. “The Business Fours golf tournament is a fantastic event and we’re delighted that the team at Riddle & Coghill won this year, raising an incredible total. On what the donation meant to them Director Gus Riddle said “We’re thrilled to have won the Business Fours event and have had a great 2 days across both events, the cracking weather helped. Riddle and Coghill beat firms from across the country to be crowned national business golf champions at the Business Fours events in 2018, the 2019 events are being launched soon with courses like Gullane, Carnoustie, Murcar Links and Haggs Castle hosting regional qualifying events for local business and full details can be found on their website here. The socially conscious events company have now raised over £64,000 for charities across Scotland since launching in 2016 an achievement Managing Director John McClarey is extremely proud of.